In "Cooking with Love," a TV producer falls in love with a cocky celebrity chef. In "My Secret Valentine," a woman bonds with a secret admirer at her family's winery. In "Very, Very Valentine," a flower shop girl is romanced by a mysterious man at a masquerade ball. These movies, in all their schmaltzy glory, premiered this month on the Hallmark Channel, which has distilled your warm and fuzzy feelings down to a science. The network best known for its G-rated romantic comedies posted its highest ratings ever last year. And it's eyeing an even bigger 2018. "We have grown by leaps and bounds," said Michelle Vicary, the executive vice president for programming at Hallmark parent company Crown Media. She said the company has amassed hundreds of original titles for the flagship Hallmark Channel and its spinoff, Movies and Mysteries. The Valentine's Day specials are only a taste of what's in the pipeline. Vicary said the company will produce 90 original movies this year for Hallmark Channel, Movies and Mysteries and the recently launched Hallmark Drama. That's the most Crown Media has ever made in a single year. If there is a season, there is a Hallmark movie — or several — for it. In an interview this week with CNNMoney, Vicary rattled off a slew of productions already planned for its upcoming "Spring Fever" season. Titles for Mother's Day, summer and fall are also in the mix. Christmas, though, is the company's crown jewel. The Hallmark Channel debuted 21 movies for the holiday last year, along with several others for Movies and Mysteries. That Christmas overload last year apparently worked. Hallmark Channel's "Countdown to Christmas" programming reached more than 72 million viewers, according to data provided by the network. It ranked as the top-rated cable channel for women aged 25 to 54 during the holidays. All that viewership brings in ad dollars. S&P Global Market Intelligence's Kagan research group projects that the Hallmark Channel brought in $370 million in advertising revenue for 2017. It expects that number to increase to more than $390 million this year. Vicary called the brand's squeaky-clean image one of its biggest selling points for advertisers. "Their brands are elevated because of what we put out in terms of a positive message," she said. "There's no downside." Another piece of the formula: giving the people what they want. Hallmark frequently casts the same actresses in its movies. Many people know Lacey Chabert from "Mean Girls" and "Party of Five." 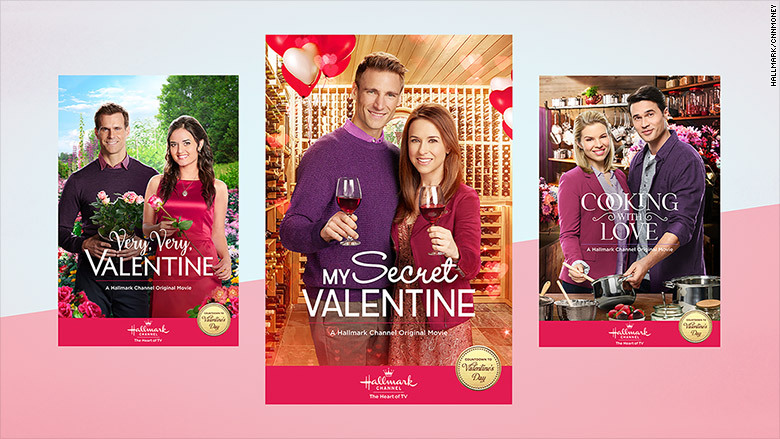 But Hallmark Channel superfans know her from roughly a dozen romances, including "All of My Heart: Inn Love" (the one about the inn in Pennsylvania), "Moonlight in Vermont" (the one about the inn in Vermont), and this year's "My Secret Valentine" (the one about the winery). "Full House" alum Candace Cameron Bure is also a veteran. Hallmark most recently cast her as a pair of twins in last season's "Switched for Christmas." "We strike a balance between what the viewers ask us for, which is, 'I want to see a movie with Candace Cameron Bure or Lacey Chabert starting in it,' in addition to new people," Vicary said. Hallmark specials are relatively cheap compared with the $6 million or more that Variety reports Netflix spends on a single episode of television. Vicary estimated that the movies cost about $2 million to produce, with a few running higher. For example, the CGI used to create a Cameron Bure twin last Christmas pushed the movie's budget into the $3 million range. Hallmark draws inspiration from a variety of sources, including books and heartwarming stories found in newspaper articles. Although hammering out scripts can take a few months to more than a year, Vicary said the shooting schedule moves fast. The films, which are mostly filmed in Vancouver, are shot in about 15 days. Hallmark's flood-the-zone approach to film making has also made the network more protective of its content. Vicary said the company used to license some of its films to other platforms. But that has changed as ratings have risen. The company has its own Netflix-like standalone streaming service, Hallmark Movies Now, which sells access to the network's maudlin romances for as little as $4.99 per month. "We're always looking at what our competition is doing, but what we have that they don't have is a 100-year legacy of a brand that is about emotional connectivity and relationships," Vicary said. "If you see content on Hallmark Channel, you're not going to see it anywhere else."